Join Jason Hartman and author of Primal Body, Primal Mind, Nora Gedgaudas, as they explore the negative effects of stress and anxiety on our brains and how nutrition is essential to a healthy brain. 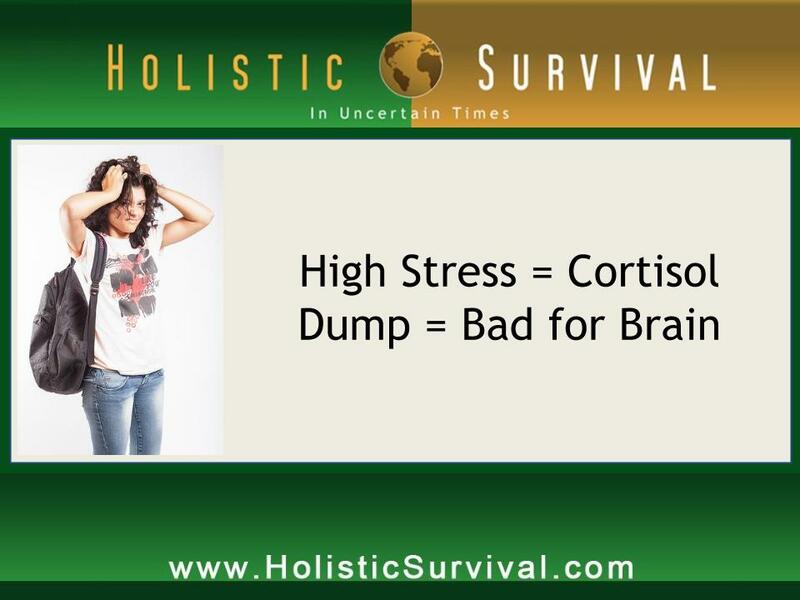 Nora explains how high levels of stress causes dumps of cortisol, leaving the brain “marinating” in it, and how it breaks down the temporal portion of the brain. Doctors tend to accept this breakdown as a sign of aging, but Nora says this is simply not the case. Just because something seems commonplace does not mean it is normal. For more details, listen at: www.HolisticSurvival.com. Nutrition plays such an incredible role in our overall health. Our food and water sources have changed to something completely unrecognizable to our ancestors, who ingested animal fat and protein primarily and were stronger and more disease-free. When we’re stressed, we often crave carbohydrates and this comes from the body expecting it because that’s what we’re feeding it. Nora describes how sugar is like kindling for the metabolic fire, burning quickly and constantly needing to be replenished. Contrary to today’s popular beliefs and fads, the fuel our bodies are designed to run on will surprise you. Nora provides insight into how to end the cravings and rollercoaster dieting, and also explains the problems with vegan and vegetarian diets, and talks about gluten sensitivity, the rise in inflammatory issues and autoimmune dysfunctions. Nora Gedgaudas is Board-certified in Holistic Nutrition® through the National Association of Nutritional Professionals (NANP) and is recognized by the Nutritional Therapy Association as a Certified Nutritional Therapist (CNT). She has appeared as a guest lecturer on radio and television. She was host of her own top rated radio program on Voice America Radio’s “Health and Wellness” channel and her “Primal Body, Primal Mind” radio podcasts are now available on iTunes. Nora served as a trainer for the State of Washington Institute of Mental Health, illuminating nutrition’s impact on mental health for State health care workers at all levels .She maintains a private practice in Portland, Oregon as both a Certified Nutritional Therapist (CNT) and a Board-certified Clinical Neurofeedback Specialist (CNS). Nora’s ground breaking book, Primal Body, Primal Mind, currently ranks near the top of all health-related books on Amazon and in August 2011, Nora was a featured presenter at the Ancestral Health Symposium at UCLA—billed as “the Woodstock of evolutionary medicine”. Narrator: Welcome to the Holistic Survival Show with Jason Hartman. The economic storm brewing around the world is set to spill into all aspects of our lives. Are you prepared? Where are you going to turn for the critical life skills necessary to survive and prosper? The Holistic Survival Show is your family’s insurance for a better life. Jason will teach you to think independently, to understand threats, and how to create the ultimate action plan. Sudden change or worst case scenario, you’ll be ready. Welcome to Holistic Survival, your key resource for protecting the people, places and profits you care about in uncertain times. Ladies and gentlemen, your host Jason Hartman. Jason Hartman: Welcome to the Holistic Survival Show. This is your host, Jason Hartman, where we talk about protecting the people, places and profits you care about in these uncertain times. We have a great interview for you today and we will be back with that in less than 60 seconds on the Holistic Survival Show. And, by the way, be sure to visit our website at HolisticSurvival.com. You can subscribe to our blog which is totally free, has loads of great information and there’s just a lot of good content for you at the site. So make sure you take advantage of that at HolisticSurvival.com. We’ll be right back. Narrator: Now is your opportunity to get the Financial Freedom Report. The Financial Freedom Report provides financial self-defense in uncertain times and it’s your source for innovative forward-thinking investment property strategies and advice. Get your newsletter subscription today. You get a digital download and even more. Go to JasonHartman.com to get yours today. Jason Hartman: It’s my pleasure to welcome Nora Gedgaudas to the show. She is the author of Primal Body, Primal Mind. And we’re going to talk about something that we are all faced with in today’s world with far, far too many things going on and that is anxiety and nutrition and how they tie into each other from an evolutionary perspective. And I think you’ll really enjoy this. I heard Nora on another show and thought we’ve got to get her on this show as well. Nora, welcome. How are you? Nora Gedgaudas: Oh, thank you so much, Jason, for having me. I’m doing great. It’s really a pleasure and an honor to be here. Jason Hartman: It’s my pleasure as well. Your book, it’s got 4 and ½ stars with 82 reviews on Amazon. And it’s a fascinating subject, it really is. I don’t think we were ever built for this type of sensory overload that we have nowadays. Just the number of advertising messages we’re bombarded with in one day is equivalent to an entire lifetime of maybe our ancestors just 2 generations ago. It is mind-boggling. And nowadays, with email, faxes, text messages, Facebook feeds, Twitter feeds, wow, how do we deal with all of this? We’re just not built for it. Nora Gedgaudas: You’re right. We’re absolutely not built for it. What we’re designed for is to be able to function in a calm, relaxed, what we call a parasympathetic state for 99.9% of the time and maybe .1% of the time. The saber-toothed tiger jumps out from behind the bush and chases us around and hopefully if we survive that ordeal then we get to go back to a place of calm, relaxed functioning again. And nowadays, what’s happened is this whole thing is flip-flopped. And now we’re all being chased around by saber-toothed tigers 24/7 and then the other .1% of the time, if we’re lucky, we get to take a trip to Tahiti. And all that really happens there is we end up stressing out the Tahitians and then coming back home again to be chased around some more by the saber-toothed tigers. So, this is the way we’re living. And the implications for this, in terms of our health, in terms of our brain function, is pretty ominous. This is not what our brains were designed to handle. 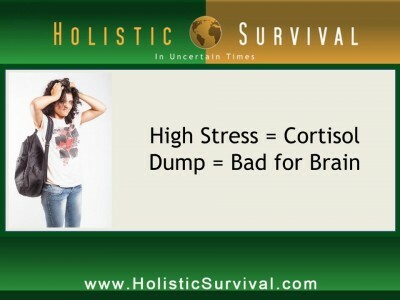 And the primary hormone in the human brain that’s designed to handle stress is of course cortisol. Many people have heard of cortisol. It’s an adrenal hormone. And the part of the brain that has the richest repository of cortisol receptors are our temporal lobes, part of your brain that’s resting just over the tops of your ears. That’s the part of your brain that mitigates stress response. And that part of your brain is very delicate. It basically is responsible for keeping your brain stable and also kind of modulating your circadian rhythms, right? Your sleeping and awake states and all of that kind of thing. It’s also the part of the brain that moves short term memories into long term memories, so very important for memory function. Well, what happens when this part of the brain is being marinated in cortisol 24/7? Jason Hartman: It’s sort of like we have the fight or flight response all the time nowadays rather than just occasionally, right? Nora Gedgaudas: Right. But here’s the really, really troubling implication. Because cortisol is what can be referred to as a catabolic hormone. I promise not to get overly technical on you, but what catabolic means, there’s catabolic and there’s anabolic – anabolic builds things up, catabolic brings things down – so what happens, when that part of the brain is being marinated so consistently in that type of hormone is that that part of the brain starts to break down. And what radiologists are seeing now, that are looking at films of brain scans, relatively young people are temporal lobes that look like Swiss cheese. And they’re starting to refer to this as a normal variant of aging. I’m here to tell you there’s nothing normal about it just simply because it is becoming commonplace. And the implications are deeply troubling because what this implies, well one thing that we know and that part of the brain starts to break down, we lose our ability to mitigate stress response. Our brain goes into a state of overdrive and now we’re riding a horse with no reins. And the other part of the implication is that this is the first part of the brain to break down. The temporal lobes, the hippocampus of the brain is the first part of the brain to break down in brain degeneration diseases like Alzheimer’s. Jason Hartman: So, say that again, though, what you said about brain looking like Swiss cheese. Nora Gedgaudas: Yes, because the temporal lobes start to degenerate in the presence of that much cortisol. Jason Hartman: That’s kind of interesting because I read something a couple of years ago when I had first heard about all these young kids are taking ecstasy, and I heard that it puts holes in one’s brain and I thought oh my gosh, that’s just scary, scary, scary. Nora Gedgaudas: Right. There become these areas of hypoperfusion. The blood flow can’t flow there. Jason Hartman: So the brain tissues just die, huh? Nora Gedgaudas: Cells start to break down and die, yeah. And these receptors get activated and these receptors get activated and the brain goes into a chronically excitatory state and starts to break down and the brain cells do. And, yes, it’s very scary because past a certain point you can’t get it back. Nora Gedgaudas: One thing to ask yourself if you want to know whether this is a problem or you or not is are you having memory problems? Do you remember things as well as you used to? Jason Hartman: Right, but isn’t that a normal sign of aging? The old saying well I’m having a senior moment. Nora Gedgaudas: Exactly. We joke about it because we think it’s funny but it’s really no laughing matter. Nora Gedgaudas: Not necessarily, no. Just because it’s commonplace does not mean that it’s normal. We are supposed to go along just fine. As we age, our brains are not supposed to break down. We’re not supposed to lose functionality as we age like that. And what’s happening is that this is occurring now at an accelerated rate. And, of course, it’s occurring in relatively young people. But it’s no laughing matter. What this implies is that your brain is degenerating, plain and simple, and there’s aspects of this functioning that you might not be able to get back. It’s not necessarily impossible to get it back and one of the things that I do in my work and that I’ve been involved with now for 50 years and it’s something that my practice in Portland, Oregon, I do a couple of different things – I do something called neurofeedback in addition to the nutritional counseling. And neurofeedback is basically a process by which you gain a functional regulatory control of your brain states by essentially learning to exercise your own brainwave activity. And it’s a form of bio feedback, only we’re dealing directly with the electrical activity in the brain. And I do some form of temporal training with virtually everybody that comes in to help people get that excitatory activity wound down so that their brains have half a chance to recover. Because, again, once that part of the brain takes off, it may not wind down on its own. It really may take something like neurofeedback or like some really concerted effort to get that part of the brain wound down again. And if you can’t get it wound down, then you run the risk of it degenerating. So, again, any form of loss of function like that at any age is not normal. And just because it may be common does not make it normal. Just like women get hot flashes and they can say well that’s just normal with woman age, no it’s not. It’s not supposed to happen that way. A woman stops having her period and that’s supposed to be it. It’s like, oh okay, I guess I don’t get those anymore, and then you go on. To get the kinds of symptoms that women get as they age, as they go through menopause, the hellish times that women go through, that’s not normal, folks. That’s not supposed to happen. Just because it’s common does not make it normal. Jason Hartman: Right. So one can either get out of the rat race and go lay on the beach somewhere in the Caribbean or can they eat, can they change their nutrition as a way to regain cognitive function? I hear, Nora, these commercials on the radio for all sorts of vitamins and things like that. I guess ginkgo biloba, isn’t that a memory aid or something? I don’t know. I doubt these claims, though. I never know if they’re true. Nora Gedgaudas: Yes, there are some supplements that may be useful to some people, but I don’t want to start…Supplements are just that. They are supplemental to what should be a foundationally effective diet. Nora Gedgaudas: An optimal diet. And there are dietary factors that have to be addressed long before you run to the health food store to buy supplements. We have to consider what stress is, right? Stress isn’t what happens to us, it’s how we respond to what’s happened to us. And we see the world through this lens that is our blood sugar, stability, our hormones and our neurotransmitters. And if those things are screwed up, then we are going to have unhealthy responses to stresses in our lives and it will get the best of us. Jason Hartman: Hormones, antibiotics, GMOs, we’ve done shows on GMOs. Nora Gedgaudas: Yeah, good. Yeah, these are important things for people to be aware of. And things like MSG which, of course, has excitatory and neurodegenerative effects on the brain and that’s in most processed foods, there are a lot of things like that and the pollutants in our air and water and all kinds of other things. We can go on and on and on about that. What we have to do is – there’s so many things that we have no control over – what I believe we need to do is take control of what we can. And what we can take control over is what we do put in our mouths. And it’s not just about avoiding processed foods, the sort of franken-foods that are getting thrown at us in a pre-packaged format. And our ancestors wouldn’t have even begun to think about getting their meal out a cardboard box or crinkle wrap. We need to start going out and purchasing food that looks like food. If it wouldn’t have looked like food to somebody wandering around somewhere between 40,000 to 200,000 years ago with a loincloth and a spear or maybe a pair of Mukluks for that matter, it’s not food for us now either. And if you start purchasing food that actually looks like food, you’re taking a step in the right direction. Of course, it could look like food and be genetically modified, right? Or it could look like food and be from an animal that was fed hormones and antibiotics and fed all kinds of unnatural things that made that animal sick before it actually wound up on your plate. Jason Hartman: So do you really have the audacity to say that Chicken McNuggets are not food? Nora Gedgaudas: It actually takes audacity to say that? Some things should be self-evident unfortunately. I think people get really cynical about all of this stuff because they hear different things from different people. Well, one day you hear this is bad for you, next day hear it’s good for you. Heck, I’m just gonna eat what I want, you’re gonna die of something anyway. And that sort of cynicism serves no useful purpose. You have to hear what you’re saying. They say yeah, you gotta drop dead of something anyway. Are they really thinking that through? Because you might just not drop dead. What if you get a stroke? Or what if you get some form of cancer that completely bankrupts you and your family who has to watch you die a slow, horrible death along the way and then you get ripped apart by the treatments that are being promoted for that, chemo and radiation and whatever else. Is it really not that big a deal? Jason Hartman: It is a big deal, no question about it. Nora Gedgaudas: It needs to be. We need to take this stuff seriously. It’s not a joke. It’s really not a joke. Jason Hartman: Let’s talk about that. Talk about carbohydrates if you would for a moment. Seems to me, and I know very little about this, but when one gets stressed out, they crave carbohydrates. Is that true? And if so, why? Is it the sugar we need to feed our brain or metabolism or what? Nora Gedgaudas: Here’s the deal. There are two different forms of fuel. We’re told that we need to depend on sugar as our primary source of fuel, that glucose is what our brain absolutely has to have in order to run and that we need that for our organs and tissues and whatever else. Well, that is sort of the official mainstream line on that. But what the real reality of that is from a physiological perspective is that that is only conditionally true. It is only true that we are dependent on glucose as our primary source of fuel if we have unnaturally metabolically adapted ourselves to that dependence. So what we’re actually designed to run on is ketones, is fat, the energy units of fat and free fatty acids which is a much more abundant and steady source of fuel. Sugar is an extremely volatile source of fuel. It’s also quite damaging to us. But if that’s all your getting your body to run on, then your body kind of adapts to that and it learns to expect it. And I talk about it a little bit from this perspective to help people understand a little better what I’m talking about. Of course, I’m from Minnesota where it gets a little bit cold this time of year. Originally I’m from Minnesota, I don’t live there now. So woods filled analogies work well for me. So, when we’re talking about the kind of fuel that we run our metabolic fires on, if you were talking about these nutrients strictly from the energy that they provide us with, sugar is basically the equivalent of kindling. And your so called complex carbohydrates, your whole grains, your beans, your rice, things like that, your legumes, those are basically the equivalent of twigs on that metabolic fire. Now, your white rice and potatoes and pasta and break and junk like that are basically the equivalent of throwing paper on that metabolic fire. Alcohol’s like throwing gasoline on that metabolic fire. Now, if you had to heat your house, using that wood stone, with nothing but kindling, well you could do it. Jason Hartman: Well, that’s what they did. Funny thing, I’ll just tie it in with economics for a moment, that’s exactly what they did in the Weimar Republic, Germany, in those inflationary times they found that it was more efficient to burn the Weimar marks, the currency in the fireplace than it was to actually go out and trade that currency for wood because it was so worthless. But I have a feeling you’re going to say that protein is the wood, right? That is the more sustainable thing? Nora Gedgaudas: No, it’s not protein. No, no, no. Again, if you’re depending on that kindling, you’re a slave to that wood stove. You’re going to be constantly preoccupied with where that next handful of fuel is coming from. And you’ll be spending all day. And god forbid you should go and run and errand or do something else or god forbid you should try to sleep through the night – and yes, there is a correlation here – and then you come back and, oh my god, the fire’s going out, and then you cram it full of paper again, right, to try to get it going or you squirt some lighter fluid on there to try to get it going again. This is how people live their lives. And, by the way, who do you think profits when we’re dependent on kindling? Anybody who happens to be in the food industry business. You have the food industry, you have big Agra business and of course the petroleum industry. Jason Hartman: I was going to say Monsanto profits for sure. Nora Gedgaudas: The M word, yes. But it goes so far beyond that. The pharmaceutical industry, the medical industry because when you have people depending on carbohydrates as their primary source of fuel, you also have people who end up becoming metabolically deranged as a result of this. This is something that has far ranging implications for your entire hormonal system. So what is the alternative to this, right? Well, what if, instead of using kindling all day long, suddenly now you have a nice big fat log you can throw on that fire? Well, dietary fat is actually the fuel that we are designed to run on. We’re not able to store more than maybe 2000 calories of glucose in our bodies at any given time in the form of glycogen in our livers and in our muscles, and that’s not a lot. I mean, that’s like a day’s worth of energy at best. Most people who are depending on carbohydrates as their primary source of fuel, which is better than 90% of our population, most people are not more than about 2 meals away from a state of total chaos, and 2 missed meals away from a state of total chaos because you’ve got to keep replenishing if you’re gonna be running on that kind of fuel. We’re ice age beings. We’re creatures of the ice age. Fat, to us, means survival. And the one macronutrient of the 3 macronutrients – proteins, fats and carbohydrates – that our hypothalamus is attuned to is fat. Not protein, not carbohydrates, but fat. And the hormone leptin is maybe the single most important hormone in the entire human body is actually at base a fat sensor. It is trying to decide whether or not hunting is good. That’s what tells us whether hunting is good or not. So, when we consume sufficient fat – even the most slender person listening to this show probably has enough body fat stored somewhere – to be able to, if you absolutely had to, you could live for close to a month. I’m not saying you’d be happy to do that or that it would be easy or fun or that you should consider that, but it could be possible. And more efficiently, you’re able to make use of fat. In other words, the closer you keep those logs to the fire, the easier it is to keep that fire going with a minimum of effort. And if you’re able to metabolically convert yourself to a dependence on dietary fat rather than sugar as your primary source of fuel, now all of a sudden you’re free. You throw the log on the fire and you can go off and live your life. And suddenly you’re not preoccupied with where that next handful of fuel is coming from. You don’t crave things anymore, you don’t have big ups and downs. And, by the way, if you are that metabolically adapted to that carbohydrate, bringing back to the topic at hand, and your blood sugar gets down too low, that’s a state of crisis because that’s what your brain is expecting. Jason Hartman: Okay, just to simplify because there’s a lot in there that you’ve been saying, I want to make sure people hear that one thing and just come back to that one key thing which is how do you end the cravings and the roller coaster dieting and blood sugar and so forth. How do you do that? Nora Gedgaudas: You’ve got to get away from the sugar and starch in your diets to the extent that is possible. Jason Hartman: And replace it with what? Nora Gedgaudas: A moderate amount of protein. And make sure some of that protein is coming from animal source foods because that’s complete protein. All of the essential amino acids are there. And in those types of proteins, you don’t have starches coupled with them so that you’re getting an efficient source of protein and make sure you eat enough fat to satisfy your appetite. And you can eat as many fibrous vegetables and greens as you want because there are antioxidants and nutrients there that I think are more important to us now than they ever even used to be. Jason Hartman: Right, okay, but hang on a second. The animal protein is the highest quality protein? What does that say for the vegans, the vegetarians? Nora Gedgaudas: It’s a problem. It is a very serious problem. Jason Hartman: It seems to be a problem because I tried that for a while and I didn’t feel so great. Nora Gedgaudas: So did I.
Jason Hartman: I think we’re meant to be omnivores, aren’t we? Nora Gedgaudas: We don’t have the digestive tract of an herbivore. I don’t know about you – I don’t have four stomachs. I don’t know anybody who has four stomachs. The animals that are designed to make use of a carbohydrate based diet, what are they doing all day long? Their faces are in the bushes, they’re on the ground, they’re eating constantly. And they’re designed physiologically to handle that kind of a diet. But they have a bacterial based digestion that is working on that stuff all day long to help them meet those metabolic and caloric needs. The irony is that where a cow actually gets its calories isn’t carbohydrates. Even a cow isn’t dependent because what’s actually happening is the bacteria are actually transforming that carbohydrate based food into saturated fat, the uric acid. Cow, over 70% of its caloric intake is actually coming from fat, but we are not designed to make that conversion so efficiently. We’re just not. And so, for us, we need to get those things more directly, and we need to be getting our fats from a variety of natural sources. Animal fat would be one of the things. But the thing is, people hear the word fat and they panic. Fat is not one thing. Fat is many things. I will say there are 2 or 3 instances where fat is a very bad thing. Artificial fats that come from test tubes, in other words hydrogenated oils, trans fats, are the fats that we all need to be avoiding at all cost. And I’m here to tell you that even some products that say trans fat free have trans fats in them. You have to look very closely at the label. And anywhere you see soybean oil or canola oil, I’m here to tell you that all commercial soybean oil, all commercial canola oil – and these are vegetable oils, people don’t realize – are partially hydrogenated as part of their deodorization process. And that’s not on the label necessarily. So you’re getting trans fats if you’re consuming those foods, and right now the number one source of fat coils in the American diet is hydrogenated soybean oil. It’s in all the processed foods and it’s in fast food. So, those are the first things we have to get out of there. Then also the highly processed vegetable oils, your safflower oil, your corn oil, your canolas of course and soybean I just mentioned, but most of the processed vegetable oils that people are used to cooking with. Our ancestors would never have thought to take a sunflower seed and mash it down to squeeze the oil out of it so they could fry up their wooly mammoth steaks. That’s not what they did. If they found a seed, they ate the whole thing. When you remove the oil from the seed, what you do is you create something that’s very unstable. And these oils are really, really prone to going rancid in a heartbeat. They go rancid very, very, very easily. They are also very high in a form of fat called omega-6. Now, we need a little omega-6 but it’s not hard to get. But these vegetable oils are so dominated by them. And what omega-6 is doing to your body is they made inflammatory compounds. So, if you want to suffer in a state of chronic inflammation, then eat all the vegetable oil you want, but it’s a problem. Jason Hartman: I want to just try and make this as clear and simple for listeners. First of all, are you a believer in the paleo diet? Nora Gedgaudas: Yes, I believe that that is an important starting place. And, of course, my book, the subtitle is Beyond the Paleo Diet for Total Health and a Longer Life because I think we have to take some steps beyond that and I talk about why in my book. Jason Hartman: And what is the paleo diet, just in a sentence? Nora Gedgaudas: What the paleo diet basically is is a diet that looks at what the evolutionary history of the human diet has been, how have we been eating as a species for close to 3 million years. What are the dietary principles? Jason Hartman: It’s more meat oriented, isn’t it? Nora Gedgaudas: Well, basically what is true about us that 99.99% genetically we are all hunter/gatherers. Jason Hartman: More than agricultural. Agriculture only came about like 3 to 5 thousand years ago. Nora Gedgaudas: We started 10,000 years ago. Areas in Europe didn’t adopt it until maybe a couple thousand years ago. And then some people group, more native people groups, it’s only a couple hundred years old for them. So, yes, agriculture is very new to the human species. Grains and legumes are new foods to us and we are not designed to consume them. They contain anti-nutrients, certain compounds that had extremely detrimental effects on the functioning of our bodies and the functioning of our brains. Nobody wandering the earth anywhere has any such thing as a grain deficiency. There is no such thing. And right now gluten sensitivity is literally a pandemic. And what is a pandemic right alongside it are autoimmune disorders. I’m telling you, those are going to be exploding. Jason Hartman: Where is the gluten sensitivity thing coming from? Nora Gedgaudas: Well, we know gluten is either going to generate or it’s going to exacerbate auto immune processes. Of course, gluten is a protein that is found in many grains. And it’s a very large, very difficult to digest molecule. And one of the effects that it has on the human body is it stimulates an enzyme called zonulin. Now, I know that sound like something from the Star Trek movie. Jason Hartman: Is that something the Romulans use? Nora Gedgaudas: Watch out. We’re being attacked by the Zonulins, yeah. But zonulin basically controls intestinal permeability. It also controls blood-brain barrier permeability. And what happens when we produce this enzyme is it opens up these normally very tightly controlled channels that are very selective about what they take into your bloodstream and what they don’t. And it just opens them wide open so that now anything can get through. And when you have poorly digestive peptides and things like that slipping into your bloodstream, your immune system goes on high alert and says wait a second, this isn’t on the list of okay things that are coming through and therefore this is an unrecognized invader and we need to tag this thing and we need to destroy it. And so your immune system goes on hyper alert. Part of what that results in is inflammation. And part of what this also results in is the production of antibodies. You hear about people who have multiple food sensitivities. I would say probably most of your audience have food sensitivities that they are unaware that they even have. Jason Hartman: Yeah, it’s kind of amazing because, I’ll tell you, Nora, when I was a kid I never heard about all this stuff. All this stuff is like a new thing. I never heard of anybody with a peanut allergy. Nora Gedgaudas: Right. Allergies and sensitivities are actually two different things. It’s two different types of immune reactions. With an allergy, there’s also the risk of anaphylactic shock, and that’s where you’re being rushed to the hospital and all that kind of a thing. Sensitivities have more of a delayed response and have a different type of immunologic response. Actually, for some people, it may be quite immediate. They may notice they suddenly have brain fog or that they suddenly feel inflammation or that they’re getting aches and pains in their joints or they may have digestive disturbances or they may suddenly get a migraine, that kind of thing. So, in effect, you also wait from your hair follicles down to your toenails. Jason Hartman: What is celiac disease? Nora Gedgaudas: Celiac disease is a form of gluten sensitivity that it’s actually identified by the genetic markers that get activated for it and it tends to be a direct reaction. They look usually at just alpha gliadin, but it could be alpha/beta/omega or delta gliadin and what it tends to result in is the erosion of these little fingerlike projections in your small intestine called villi that absorb your nutrients. And only when those little fingerlike projections that look like shag carpeting in the inside of your small intestine, when those get worn down to berber, that’s when you are diagnosable with celiac. If they’re only partially worn down, your doctor says oh you’re fine, go home, have some bread. So, this is another problem is the standard of diagnosis with these things is it needs to be revisited. Because most people are not diagnosed with autoimmune disorders until so much destruction has occurred to the tissues that now there’s no choice but to give it a label and give them a diagnosis. But many people are walking around with autoimmune processes that are unaware of the fact that their bodies are actually attacking themselves and these things can result in everything from dementia to not just gastrointestinal problems but joint degeneration. These things can result in every manner of disease process including things like a very high percentage of people with, for instance, bipolar disorder or depression, have antibodies against their own serotonin. Parkinson’s patients are producing antibodies against their own dopamine. Jason Hartman: Okay, so that’s a common one. Can people actually cheer themselves up or overcome depression with food and nutrition? Nora Gedgaudas: I believe that is an essential place to start and I think you can cover a lot of ground with that. 73% of celiac patients have clinically diagnosed trait anxiety disorder. And 63% of them have clinically diagnosed depression. And that’s right out of the American Journal of Medicine that has stated that. And celiac disease is just the tip of the gluten sensitivity iceberg. This gluten sensitivity is not a benign thing. It’s a lethal thing. And because there is no human dietary requirements for carbohydrates actually of any kind. We can make all the glucose we need from a combination of protein and fat in the diet. We can manufacture all of it. Every single molecule of glucose that we need for running our brain, for running our organs…Actually, the only tissue in the human body that has to have glucose all the time as its primary source of fuel are our red blood cells. They feed anaerobically in order to preserve their precious cargo which is oxygen. Jason Hartman: What do you say about 70% of the planet lives on a base diet of rice? Nora Gedgaudas: Yes, that’s right. And they become dependent on kindling. I mean, I get you have to recognize if you want to you can manage your blood sugar. You can do that. You can sit in front of that wood stove and you can throw handfuls of things in all day long if you want. That is an option. And this is the reason why most mainstream nutritionists will say always eat a big breakfast, eat every 2 hours, don’t skip meals, right? Because you’re having to manage that blood sugar. I have better things to do with my time. I would remove blood sugar from my mood and cognitive equation altogether. Now, I don’t have to worry about what my blood sugar is doing ever because I’m not dependent on blood sugar for my primary source of fuel. I’ve metabolically adapted my body on a dependence on ketones, keytones and 3 fatty acids to run my metabolic stove. And, as such, I eat a lot less, so I actually get fewer calories in the course of a day and my mood from my energy remains stable throughout the day. I don’t have to worry about if I happen to skip a meal I might get hungry, but I’m not gonna get a funky mood, I’m not gonna have snakes start growing out of my hair, I’m not gonna become irritable or brain fogged or shaky the way some people do. The way you know whether or not you have a blood sugar problem, whether this is really an issue for you, ask yourself how do you feel before you eat? Are you tired, are you really fatigued? Are you crabby? Are you shaky? Are you really reactive to things? And also, ask yourself how do you feel after you eat? Are you more energized? Or are you more fatigued than tired? Jason Hartman: Should people have that dip after they eat? Nora Gedgaudas: If you answer yes to any of what I just said, you have a problem. That’s not the way it’s supposed to be. Jason Hartman: So I just want to clarify, though, Nora. So there should be no loss of energy due to digestion after eating, immediately after? The common thing is the afternoon laziness after lunch for the next hour or 2, how people get tired after lunch. Shouldn’t happen? Nora Gedgaudas: That’s not normal. That’s not supposed to happen. You know how you’re supposed to feel before you eat? If anything, hungry. You know how you’re supposed to feel after you eat? Not hungry. That’s what’s normal. Your energy is supposed to run pretty evenly. There shouldn’t be this roller coaster ride. You’re only having a roller coaster ride if you are metabolically adapted to sugar as that primary source of fuel. And I’m here to tell you sugar is very, very volatile. Again, sugar has a lot of damaging effects in your body. It attracts a lot of free radical activity to your tissues and your blood stream. Your body’s pretty much obsessed with maintaining the lowest amount of blood sugar necessary at any given time. When you eat a meal that has a lot of carbs in it and you spike your blood sugar up, that’s an emergency because it’s doing a lot of damage. So your body produces insulin, which by the way is not supposed to be a blood sugar hormone, but it acts by default that way, and it grabs that sugar and it tries to drive it into your cells, it drives it out of your bloodstream, it tries to drive it into your cells to the extent that it can and whatever it can’t it then converts to triglycerides in your liver and then converts to body fat. That’s where most unwanted body fats come from are these dietary carbohydrates. It’s not fat that makes us fat – it’s usually carbohydrates that make us fat. So, then now your blood sugar drops down really low. Well, if you’re dependent on that sugar, that’s an emergency. And guess how your body gets that sugar back up again, your adrenals fire. You produce adrenaline. Adrenaline drives the sugar back up because it thinks you’re being chased by a saber tooth tiger. This a crisis, this is an emergency. And what is that associated with? Feelings of fight or flight. If you have chronic anxiety, I promise you you need to take a good hard look at what’s happening with your blood sugar, because that is a very, very powerful influencing factor. This was the first thing to get under control because you’re on this roller coaster ride all day long that is going to put you in a very anxious state. The other thing that happens with blood sugar surges is this also stimulates, with surges of insulin and leptin, sympathetic over arousal. Again, sympathetic over arousal is fight or flight. It also generates inflammation. And inflammation is a stress response. So, that stress response is basically creating more anxiety and so it’s a vicious, vicious cycle. Announcer: What’s great about the shows you’ll find on JasonHartman.com is that if you want to learn how to finance your next big real estate deal, there’s a show for that. If you want to learn more about food storage and the best way to keep those onions from smelling up everything else, there’s a show for that. If you honestly want to know more about business ethics, there’s a show for that. And if you just want to get away from it all and want to know something about world travel, there’s even a show for that. Yep, there’s a show for just about anything, only from JasonHartman.com or type in “Jason Hartman” in the iTunes store. Jason Hartman: I heard someone say once that basically what everybody dies of is inflammation. Nora Gedgaudas: Right, absolutely. Inflammatory disorders right now, most of the disease processes we look at have inflammation as a base issue. And if we look at the things dietarily that chronically generates inflammation, what are we looking at? We’re looking at carbohydrate based diets. We are looking at things like artificial trans fats. We’re also looking at these omega 6 vegetable oils which generate inflammatory compounds in the body. We’re looking at food sensitivity issues which is epidemic. It’s absolutely pandemic, as is autoimmune. We’re going to be hearing more and more about autoimmune in the years to come. The field of immunology now is just exploding with literature and it’s deeply disturbing because we realize the extent to it is inflammatory compounds are sitting in our food supply and we are being told by the US Department of Agriculture to make some of these foods the foundation of our diets. Jason Hartman: I want to ask you about that. With the food stuff and the debasement of our food supply in so many ways, if you watch Food, Inc., King Corn, any of these documentaries, you read Diet for a New America which, again, I kind of don’t agree with that now but I used to years ago, you just realize that the food supply is being so centralized, the government, and I have to say, oddly enough, the seemingly worst offender has been the Obama administration, is centralizing, controlling, and passing laws against people growing their own food. And it’s so hypocritical with Michelle Obama setting up a garden in the White House. It’s a complete hypocrisy. Nora Gedgaudas: I totally agree with you, yes. Jason Hartman: Are they just doing this for economic purposes? Is it just because it’s cheaper to make the food and that kind of stuff? Or is it a more ominous and evil motive? Nora Gedgaudas: Basically, this has nothing to do with politics in any way, shape or form. America is not a democracy, it’s not a republic, it’s a corporatocracy. Jason Hartman: Yeah, I agree with that. It’s a form of feudalism or fascism combined with socialism. Nora Gedgaudas: I agree. It doesn’t matter who ends up in the major political offices. It wasn’t about Bush. They basically were getting the same policies no matter who’s in office. And this has been a progression over the last several presidential administrations to the state that we’re in now. And part of what we’re seeing, too, and it’s heartening to see this new spark of consciousness and sort of recognition of our own collective power, this occupy movement that’s starting to spark all over the place. Jason Hartman: Yeah, I think that’s great. I don’t agree with everything, but I think the fact that they’re creating awareness is great. Nora Gedgaudas: I have an article about that actually on my blog right now at primalbody-primalmind.com, people might want to go take a look at it. But basically, I’m here to say that there’s nothing in this world that is more important than owning and occupying your own body and mind and your own food supply because without that, without our health, we have absolutely nothing and we can never possibly be free. We’re completely vulnerable and completely malleable. And, yes, the ultimate tyranny is the deterioration of our food supply in the name of profit and this is what has happened. So, what we need to do is go out of our way to find food that is unadulterated food. People think of meat, animal food, as being an unhealthy thing. But the health of the meat that you eat directly correlates to the health of the animal that meat came from. Go out and make sure that you are getting your meat from exclusively 100% grass-fed, pasture fed sources. Look for pastured poultry, look for pastured eggs. And what you might have to do is not go to the grocery store. I actually recommend you go to the stores and demand that’s what you want. You let them know that that’s what you’re gonna spend your money on and you let them know what you’re not gonna spend your money on. Jason Hartman: But then you never know if you can believe it anyway, the labels. Nora Gedgaudas: You’re right. So, what I recommend people do is develop as much as possible a firsthand knowing of where your food comes from. Go to the farmer’s markets, get to know the farmers. Go to the farms. Look into the eyes of the animals that might end up on your dinner plate and look at how they’re being raised, how they’re being treated, what they’re being fed so that you know either grow your own food or get your produce from the locally grown sources as much as possible, go to farmer’s markets, like I say, or grow your own if you’re able to do that. Some of this may end up boiling down to civil disobedience. I mean, there are people that are now creating these private co-ops all over the country where they are following these principals and going directly to the farmers and then developing these supplies and they have like food buying clubs and things like that with friends and family. Jason Hartman: And I’ve done shows on that actually, Nora. It’s interesting you bring that up because the government is trying to shut those down. Nora Gedgaudas: And they’re not doing anything illegal. They’re being cracked down on because they’re competing with corporate interests. Jason Hartman: They’re trying to keep us in the corporatocracy and force us to eat this crappy corporatized food. Nora Gedgaudas: I totally agree with you and this is where we need to be putting the occupy energy, folks. Because if they get us, if they get our health, if your health is suffering, what do you care about what the banksters are doing if you’re in the middle of a health crisis? Jason Hartman: It’s all tied together because they say the average chemotherapy patient is worth half a million dollars to the system. Nora Gedgaudas: I was gonna say the number one cause of bankruptcy in this country right now is the health care crisis. So this is where we have to start. We have to occupy our food. This is where it has to begin. Nobody’s going to fix this for you. Nobody will ever care more about your health and well-being than you. You have to start understanding that you are responsible at base for your own health and well-being. .And that means you’re going to have to go out of your way. I’m sorry it’s not easier that it is. I’m not being exteme in telling you to go out and go to all the trouble to find these food sources. But the extreme isn’t what I’m telling you. The extreme is in the marketplace. Extreme is in what we’re being forced to accept as food when it isn’t even close to being food. And so you have to go and figure this out. And it may take people basically taking on a state of civil disobedience in order to make what needs to happen happen. You’ve got to basically take your health by storm. Jason Hartman: Yeah. Once last concept I want to just ask you about. And I have thought this for maybe 7-8 years. And that is the concept…I noticed there’s a chapter, so I have a feeling you’re gonna agree with me on this and your book on Adrenal Exhaustion. And for long time I have thought about the caffeine culture and caffeine not being that bad because, I don’t know, I think coffee is actually good for you, but maybe you’ll disagree with me there – in moderation of course. But it’s the whole thing of these energy drinks. And I think these especially young people that consume those in mass are going to find 10 years from now that their adrenal glands just don’t work anymore, they’re just blowing them out. Nora Gedgaudas: Well, here’s the thing. We were presented with this whole adrenal model of things by Hans Selye back in the 1950s and he was a great researcher. And he presented this whole model of progressive adrenal exhaustion, whatever. Well, guess what? There’s a little bit of a myth associated with that. That’s not really accepted anymore in the literature. Adrenals are just a factory. What regulates our adrenals, and what people call adrenal exhaustion, isn’t our glands. 90% of the time it’s not a gland problem, it is a brain problem. There are different areas of the brain that control and mitigate our adrenal response. Those temporal lobes we talked about at the beginning of the show? That’s what controls our adrenal rhythms. And if that part of your brain is damaged, then those rhythms are running amuck and you’re waking up at 3 o’clock in the morning and you can’t go back to sleep and then 4 o’clock in the afternoon you crash and you can’t get your energy back. Those circadian rhythms are controlled not by your adrenals but by the temporal hippocampus of your brain. Also, the amount of cortisol you produce is largely controlled by your hypothalamus in your brain. There’s something called the HPA axis, the hypothalamic pituitary adrenal axis. And the amount of cortisol that you produce is totally controlled by those signals. Well, those signals can be dampened by things like inflammation. If you have chronic inflammation, your energy levels are gonna be in the toilet because your hypothalamus gets dampened and doesn’t give proper signals to cortisol. And so you’re gonna feel fatigued and out of it and like you can’t get anywhere. And inflammation could be due to many, many different things, chronic infections…One of the things I do in my work is I look at functional blood chemistry panels in people. And one of the things I’m seeing that seems absolutely epidemic is immune suppression. People have really depressed white blood cell counts now. And they’re suffering from chronic infections of all different kinds, viral, bacterial, parasitic and you have that kind of thing going on, you’re inflamed all the time, and you have no energy. So, that’s not adrenal exhaustion. That’s not exhaustion. That is your adrenals not getting the right messages or getting messages, I should say, that are suppressing you instead of enhancing your energy levels. There’s also this mid-brain, sort of mesencephalic midbrain that we have that is a very, very primitive part of our brain. That part of your brain is all about survival. That’s the part of our brain that produces the brain’s version of adrenaline, epinephrine and norepinephrine. It also has the richest repository of inflammatory receptors. It’s the most prone to inflammation. And basically, when you get emotional shocks and things like that to your system, that’s the part of the brain that becomes overactivated. So what that part of the brain controls is the amplitude of your stress response. And so that’s not adrenal stuff. That’s brain stuff. And so our brains are really, at core, the thing that we need to manage. And the things that are very important for the brain are dealing with those blood sugar issues. I prefer eliminating blood sugar from my mood and cognitive equation. Our brains are made up of more than 80% or roughly 80% fat. We’re fatheads, folks. And your brain needs fat in order to function and it needs fat from a variety of sources. Half of the fat content in your brain is actually made up of saturated fat. And that’s very important. It needs to be there because it’s inherently resistant to oxidation. It helps protect the more delicate polyunsaturated fats like omega-3s in your brain. Jason Hartman: So, you’ve mentioned the fat thing several times. Where do we get the good fat? Nora Gedgaudas: Good fat comes from natural sources. Good fat comes from naturally raised grass-fed meats and so animal fats, yes, are very important and the omega-3s are a form of animal fat. Nora Gedgaudas: Right. Wild caught fish, extra virgin organic cold pressed olive oil, that’s fine because that’s actually relatively stable. Coconut oil is wonderful. That’s a great way, too, to kick start the whole ketogenic process because coconut oil actually converts the ketones very, very quickly. And so you can start burning ketones very quickly by using coconut oil. It’s also very, very stable, so you can cook with it much more safely than you can any vegetable oil. I never cook with olive oil, by the way. I only use it as a flavoring in my salad. Jason Hartman: That’s what I’ve heard. Olive oil, I used to cook with it, but it has a low smoke point. Nora Gedgaudas: It becomes rancid very quickly. Fried fats are another very, very bad fat. You don’t want to overcook fats. So, nuts and seeds are another wonderful source of fats. Avacodo are a wonderful source of healthy fat – olives, things like that. There are many great natural sources of fat. Fat is made up of many, many different compounds that have many different roles to play in your body. The kind of fat that you need from carbohydrates is basically palmitic acids, one type of fat and it’s what you store in a way that you would rather not have. But when you consume fat, fat has so many roles to play. And by the way, fully a 4th of your body’s cholesterol, 25% of all the cholesterol in the human body is actually in the brain and it gosh darned well better be because we need cholesterol for healthy, natural brain function. And if you have cholesterol levels that are too low, you run the risk of cognitive dysfunction in addition to the risk of cancers and many different immune compromises. You need cholesterol for healthy immune functioning, you need it to make your hormones, you need it for proper neurotransmitter functioning. It plays so many important roles. And so don’t be afraid of these dietary sources of fat and cholesterol. We’ve been consuming them, folks, for nearly 3 million years. They didn’t all of a sudden become problematic to us. Many of these so called diseases in modern civilization have only become problematic in the last 100 years or so. It’s not like animal fat suddenly became concern in terms of creating disease for us unless of course you’re talking about the kind of animal fat that comes from animals that have been fed nothing but grains which are not natural to them and shoved full of hormones and antibiotics and gum wrappers and cement dust and all the other crap that they feed a lot of animals. I give no argument to the person that said that kind of meat is unhealthy. It’s not food. It’s just not. And so what we need to do is understand the way we evolved and apply those principals to the way we feed ourselves now. That way of eating for nearly 3 million years is what established our physiological and nutritional requirements. And the more we’re able to meet those needs by applying those principles, the better off we are. It’s a foundational place to start. I also talk in my book about how you can kind of go beyond that and apply some new discoveries in science and in gym and longevity research to actually take those principles and make them even more effective so that you can live a longer, healthier life than even would have been possible for our ancestors. It’s very, very exciting information. And the really, really cool thing is that this is affordable by virtually everybody. There’s a myth that somehow in order to eat well means you have to be wealthy. Nothing could be further from the truth. There’s an ebook available through my website. I didn’t write it, but somebody wrote it basing many of the principles on my book. And what they do is they show how you can make – this way it’s eating – almost 100% affordable by virtually anybody. I don’t care what your economic problem is, if you’re on food stamps or what. This is affordable by everybody. And one of the things that she did in the book is she created a week’s worth of menus based on the standard American diet, what people typically do, their Hamburger Helpers and their fast food and all that kind of thing. If you broke it down to the last penny what you spend on these different meals, created a week’s worth of meals and then put the cost next to each meal, then she went and she created a week’s worth of meals based on the principles in my book, and not only was it cheaper to eat the way I’m advocating – and we’re talking about 100% grass fed totally organic food that everybody thinks is so expensive, but it was not only cheaper but it was roughly $1500 per person per year cheaper. Can you imagine what this could save a family? Jason Hartman: Sure, sure. You could buy a couple of rental properties with that extra money every 4 years or so maybe. Nora Gedgaudas: Yeah. If you go to the resources page on my website, you can find that book. It’s called Primal Tightwad. And you can click on that link. It’ll show you how to purchase that book. It’s amazing, it’s brilliant. Jason Hartman: That’s great. Well, Nora, this has been very, very interesting. Give out your website one more time and maybe tell them where they should buy the book and so forth. Nora Gedgaudas: Yes. My website is www.PrimalBody-PrimalMind.com. I encourage everybody to go there, sign up for the newsletter. I’m going to be creating a member site in the near future, too, where I’ll be doing podcasts where people will get a little bit better access to me. And I’m also going to be releasing a workbook soon that is like a quick start guide to primal health that will help people kind of handle them a little bit more towards making some good dietary changes for themselves. The other thing is that my book right now has its own display at all the Barnes & Noble stores around the country and they’re offering my book at a 20% discount. You can also buy my book through my website and I encourage people to do that – that helps me out a little bit. But any way you do it, it’s available of course on Amazon and all the book stores, so there you go. Jason Hartman: Well, excellent. Nora, thank you so much for joining us today. This is a huge topic. The book has numerous entries in its table of contents as well as appendices. So, a lot of data there and it’s very, very scientific. So, thank you again for joining us today. Really appreciate it. Nora Gedgaudas: Oh, thank you so very much for having me. This has been totally great.